I am a huge fan of Philip Glass and I anticipate you are too. I am also a fan of steel pans and I anticipate you are too. If you are unsure of your position on either of these affirmations, you are certainly in the right place to in- vestigate your opinions via a unique listening experience. Messiaen was one of the pioneers in identifying correlations between music, sound, color and emotion. I believe a convincing case could be made that Messiaenï¿½s findings are consistent with the feelings of exhilaration, joy, tranquility (and many other emotions) found when listening to Glassï¿½ music. These emotions emanate from the repetitive, familiar and often unexpected yet comforting harmonic changes that are the essence of his signature style of composition. The timbre of steel drums inhabits a sound spectrum similarly stirring up feelings that are scintillating and evocative, as is Glassï¿½ music. I have spent over two decades arranging Glassï¿½ music for percussion ensemble concerts at the Aspen Music Festival, Peabody Conservatory, New York University (where I am the Director of the NYU Steinhardt Percussion Pro- gram) and Juilliard Pre College. It is within these essential “think tanks,” that I have observed my student’s (the future of music) shared passion for the music of Philip Glass. The NYU Steinhardt percussion students who recorded these arrangements are the true heroes of the day. They embraced and mastered a set of instruments that are far removed from anything they had learned early on in their music careers and found success in the mastery of these most won- drous instruments. Steel pans are bizarre by virtue of their point of origin. Simply put, they are oil drums (yes, used for the transport of oil, such as that found on our shorelines recently), which have been hammered (tuned to specific pitches) and can play a chromatic scale, just like a Stradivarius violin. The difference between a Stradivarius violin and a steel pan is about 3 million dollars, yet arguably the same sort of music can be played equally well on both. The steel pan is a relatively new instrument, thanks to the US Military’s dumping of oil drums on the Caribbean islands. The island folks, who deserve all of the credit for their ingenuity and creativity, found a way to heat the oil drums, which allowed them the ability to literally stretch the metal while hammered upon. This resulted in a sort of hodgepodge manner of establishing pitches on the oil drum bottoms. Simply put, imagine if each piano or violin you played had its own unique key/string configuration. Steel pan players are not only versatile and flexible; they are immensely skilled musicians. Josh Quillen is the director of NYU STEEL and in addition to arranging the piano etudes, has educated the NYU students in the art of steel pan. The piano etudes are amongst Glassï¿½ most often performed works and yet they remain unpublished. The op- portunity to arrange the etudes and the subsequent performances that will follow (you have to see this played live by eighteen pan players!) will inevitably strengthen their audience appeal and the awareness of Glass’ concert music. To compare the original piano version with the newly created steel version is much like hearing Mahler’s arrangements of Strauss, Stokowski’s arrangements of Bach, Emerson, Lake and Palmer’s arrangements of Mus- sorgsky, Zappa’s arrangements of Stravinsky and Stravinsky’s arrangement of Happy Birthday. You get the idea… same music, different depiction. I feel very much the same way about this rendering of the piano etudes. There is nothing like the real thing, but this is very much an unusual and insightful restaging of a piece of artwork that has the flexibility to assume and sustain myriad guises. If the composition is good enough, the instrumentation can be flexible, because it is in essence, all about the notes, harmonies, melodies, and rhythms; not necessarily who and what plays those notes, harmonies, melodies and rhythms. 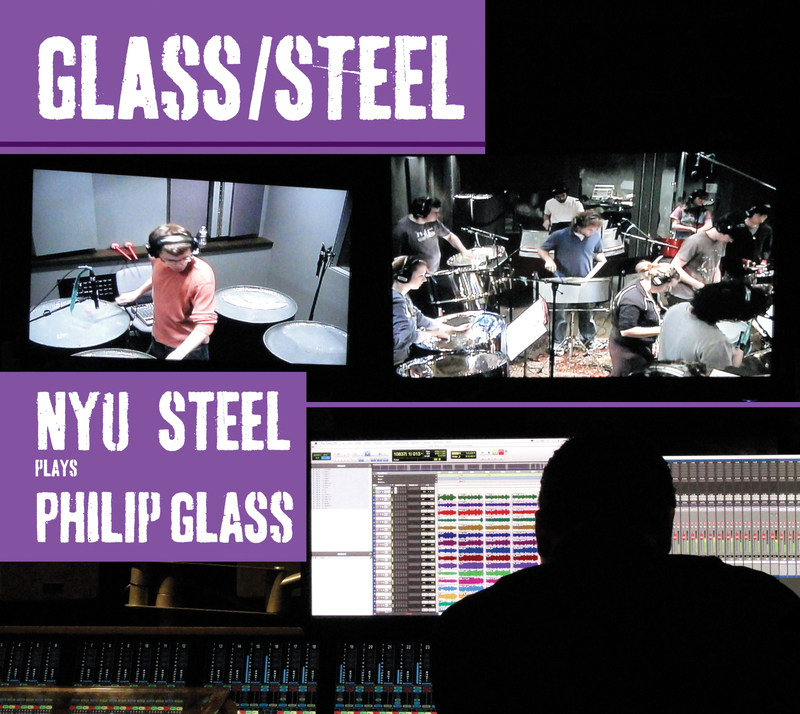 NYU STEEL was recorded in NYU Steinhardt’s James L. Dolan Studio on May 17th – 19th, 2010. At the helm of this recording was NYU faculty member and recording engineer Paul Geluso. We squeezed tons of steel pans and players into the studio, put the bass pans in an isolation booth, and set out to record the etudes. The sessions went long at times, but with the assistance of a constant flow of pizza, the recordings took shape with incredible speed and success. The future of this project holds many possibilities. It is my intention to tour this music and fortify a worldwide audience for both the steel pan and Philip Glass. Music is the perfect vehicle to bridge disparate cultures that know little of each other, which build bridges into the music world for my students, while bringing happiness and joy to the many fans of Glass’ music and that of the vibrant Caribbean. For the best listening results may I suggest that you sit back, find yourself a beverage that is served with an umbrella in it, and I anticipate you will be amazed at how inordinately evocative and universal the sound of this music becomes in the hands of the newly discovered masters of steel pan. Special thanks: Dr. Lawrence Ferrara: Chair, NYU Steinhardt Music and Performing Arts Professions, Dr. Robert Rowe: Vice Chair NYU, Steinhardt Music and Performing Arts Professions, Dr. Mary Brabeck: Dean of the Steinhardt School of Culture, Education, and Human Development, Robert Allan Knight: Associate Dean for Administration and Finance, Mark Righter: NYU Associate General Counsel, William Naugle: NYU Steinhardt Departmental Ad- ministrator, Sean Statser: NYU Adjunct Faculty and Assistant to Jonathan Haas and Josh Quillen, Simon Boyar, James Saporito: NYU Percussion Faculty, Anna Kepe Haas: Pre and Post production inspiration, Don Christensen, Heartfelt thanks for his support, patience and advocacy.